Environmental quality has been a major public concern since the first Earth Day in 1970, yet the maze of environmental laws and regulations enacted since then has fostered huge government bureaucracies better known for waste and failure than for innovation and success. 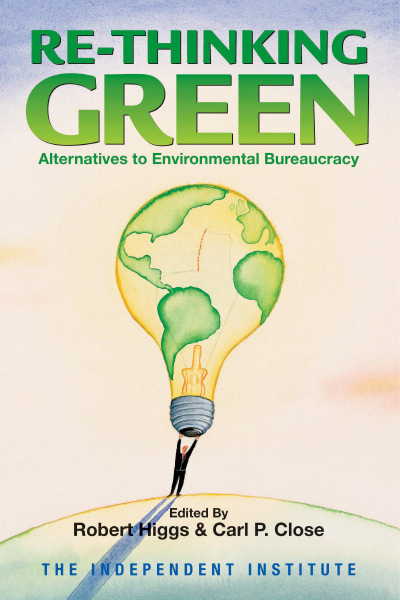 Re-Thinking Green will challenge readers with new paradigms for resolving environmental problems, stimulate discussion on how best to humanize environmental policy, and inspire policymakers to seek effective alternatives to environmental bureaucracy. Chapter 4 Population Growth: Disaster or Blessing? Chapter 7 The Endangered Species Act: Whos Saving What? Chapter 15 Is Urban Planning Creeping Socialism? Chapter 20: Market-Based Environmentalism and the Free Market: Substitutes or Complements? In Re-Thinking Green: Alternatives to Environmental Bureaucracy, twenty-two economists, political scientists, and philosophers show how environmental quality can be enhanced more effectively by relying less on government agencies that are increasingly politicized and unaccountable and more on environmental entrepreneurship and the strict enforcement of private-property rights. Many of our current environmental policies have been highly ineffective, costly, and harmful to our liberal legal and political traditions, argue the books editors, Robert Higgs and Carl P. Close, in chapter 1. Unless we are mindful of the incentives and constraints of the political processand reform our public policies accordinglythe problem of government failure in environmental policy will continue, they explain. Environmental bureaucracy has been fertilized by the idea that unless humankind reduces its consumption of natural resources dramatically and quickly, cataclysmic environmental disasters will precipitate a global depression and threaten our health and well-being on a massive scale. In chapter 2 Craig Marxsen argues that economic growth slowed significantly during the two decades following the publication of The Limits to Growth (1972)but not because of the worldwide environmental calamity that book predicted. Rather, the book created a crisis mentality that led to the enactment of ill-considered regulations that have hampered productivity throughout the U.S. economy. Sustainable development is the fashionable but nebulous term associated with proposals to deal with limits to growth. Although using the term acts to signal ones ostensibly progressive worldview, some sustainable-development theorists have advocated in its name proposals that would eviscerate our liberal political traditions, such as mandatory birth licenses, the abolition of private land ownership, and the forced resettlement of human populations in order to re-wild parts of the planet, as Jacqueline Kasun shows in chapter 3. Population growth, especially in the developing world, has also spawned worries that have fed environmental bureaucracy. In chapter 4 the late Peter T. Bauer challenges the assumption that population growth necessarily retards economic progress. It is peoples conduct, not their numbers, that causes poverty or prosperity, according to Bauer. Environmentalists and humanitarians should worry more about government policies, not poor peoples procreation, which is often associated with rising standards of living, he argues. Global warming is now considered by many to be the most troubling consequence of population growth and industrial development. In chapter 5 Bruce Yandle discusses a little-known aspect of the global-warming debatesupport for the Kyoto Accord by companies that would benefit relative to their competitors from greenhouse-gas restrictions. In chapter 6 J. R. Clark and Dwight R. Lee argue that market-based tools (e.g., tradable emissions permits) would likely mitigate any serious harms that may be caused by global warming and do so more efficiently than Kyoto-style restrictions. Endangered-species protection is a popular goal, but existing policies have fallen far short of their mark. In chapter 7 Randy T. Simmons argues that perverse incentives and lack of prioritization undermine efforts to protect threatened species in the United States. He discusses promising strategies, such as giving property owners an interest in protecting sensitive habitat, in chapter 8. Robert H. Nelson explains in chapter 9 how both biodiversity and native African traditions have been disturbed by the imposition of Western conservation strategies. Such counterproductive strategies also led to the 1989 international ivory-trade ban. Conservationists predicted correctly that the treaty would hasten the African elephants demise, but a small group of activists was still able to generate broad-based public support for the ban, as William H. Kaempfer and Anton D. Lowenberg explain in chapter 10. The tragedy of the commons arises when common-property users have weak incentives to economize on resource consumption. A similar problem arises when too many citizens assume that others will monitor government programs effectively. The resulting weak oversight allows special-interest groups to manipulate bureaucracies to their advantage, often to the detriment of environmental quality, as Richard L. Stroup explains in chapter 11. Where private-property rights are well-defined and strongly enforced, market entrepreneurs can provide environmental goods and services. In chapter 12 James R. Rinehart and Jeffrey J. Pompe show how private developers have protected sensitive shorelines. Private-property rights to sensitive habitat can also be granted to environmental groups, who would then have strong incentives to balance conservation with development, as Dwight R. Lee explains in chapter 13. In chapter 14 John Brätland shows how private-property rights can resolve both environmental externalities (e.g., offshore oil leaks and spills) and political externalities (e.g., the shifting of costs by special-interest groups onto taxpayers). Smart growth is a set of urban-planning policies that includes reducing suburban sprawl by subsidizing high-density urban living. In the case of Portland, Oregon, high-density policies have raised housing costs and increased traffic congestion and pollution-failures reminiscent of central planning in the Soviet era, according to Randal OToole in chapter 15. In chapter 16, Pierre Desrochers examines privately planned eco-industrial parks (e.g., that of Kalundborg, Denmark) and finds that government planners can do little to improve upon them other than simply to remove regulatory barriers to resource recovery. Environmental bureaucrats have adopted creative means to expand their regulatory reach. The EPAs billion-dollar legal settlement with heavy-duty diesel engine manufacturers illustrates that one new toolregulation by litigationappears to be incompatible with the agencys mandate to improve environmental quality, argue Bruce Yandle and Andrew P. Morriss in chapter 17. Environmental protection isnt advanced when agencies exaggerate their successes and obscure their failures, but the EPA has repeatedly distorted its performance in implementing the Clean Air Act, Craig Marxsen argues in chapter 18. In chapters 19 and 20, Roy E. Cordato and P. J. Hill debate the merits of excise taxes, tradable permits, and other market-based tools intended to help rationalize environmental policy. Cordato argues that because such tools are designed to help regulators meet government-chosen goals, they fall far short of a truly market-based approach to environmental policy, which would rely on price signals, the enforcement of private-property rights, and the common law of trespass and nuisance. Hill replies that despite their obvious reliance on government goals, market-based policies that utilize incentives would bring us closer to adopting a genuine private-property rights approach. Re-Thinking Green concludes with critiques of two philosophical doctrines that promote environmental bureaucracy. In chapter 21 philosopher Loren Lomasky defends the automobile against the charge that it fosters social alienation and explains eloquently how cars help individuals direct the course of their own lives. Finally, existence value (the theoretical value attached to knowing that wildlife and wilderness exist somewhere in a pristine condition, unspoiled by man) is scrutinized by Robert H. Nelson in chapter 22. Nelson argues that despite its scientific veneer, this concept is highly problematic and is rooted in a fundamentalist environmental theology. Re-Thinking Green is an important and timely book. It shows clearly the connection between bad science and bad environmental policies that neither help the environment nor are consistent with basic American values. Just as wars bring bureaucratic intrusions on our lives, misguided notions of imminent eco-disasters are used to justify an environmental bureaucracy that can abrogate basic rights of property and due process. The authors in this book show how counterproductive this kind of approach has been and how much better the environment would be served by different policies that rely more on market forces than bureaucratic rules. Those whose primary commitment is to a better environment rather than a hostility to the marketplace are especially advised to read this book."